This week sees a changing of the guard, retrograde-style: the Venus retrograde ends on 16 November, and the Mercury retrograde begins a few hours later in the wee hours of 17 November. With Mercury, the planetary ruler of communications, tech and travel retrograding till 10 December, be mindful of how you connect with others. Double-check travel plans. Back up your computer and all electronic devices. No worries, it’s all good. Let’s get to the reading: it’s interesting this week, especially for those of you who have been going through challenging times recently. LEFT: FIVE OF SWORDS REVERSED. Some of you may have been in difficult situations where other people played to win, and didn’t mind fighting dirty. Aggression, backbiting, and generally unethical behaviour was apparent. Victory was hollow, and for many in this situation, the best option was just to walk away. The lesson to be learnt here: not all fights are worth the trouble. Be sure you’re not the one playing dirty (Karma is always watching, bbs) and walk away from people who want to start unnecessary trouble. You can do better than that. MIDDLE: SEVEN OF WANDS REVERSED. Upright, this card recommends self-assertion; upside-down, you are advised to reach out to your network for their assistance in a tight spot. There’s no need to be defensive all the time – however, you need to be discerning about whom to trust and work with. But not everyone is your friend. Open the eyes of your spirit and distinguish between those who truly desire to help you, and those who don’t. When in doubt, PRAY. Ask the Universe to show you signs and give you the guidance you need. 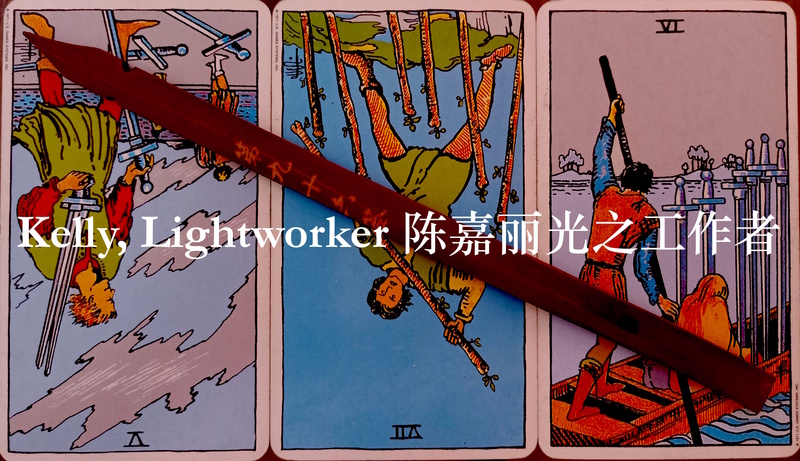 RIGHT: SIX OF SWORDS. Hang in there, darlings! The Six of Swords is here to encourage you to keep moving forward. A change in your fortunes is coming: this card can signify a physical move of location, a change of mind, and/or an escape from an ugly situation (it follows directly after the Five of Swords, which is the first card in this reading). Take some time away from the stressful situation you’re facing, and consider all your options. Then make the moves you need to make. You’re going to be okay. Love and Light to you. Radiating glory in every direction. Heaven will bestow grace and blessing upon you. This is a very positive omen to receive from the Goddess. Know that Heaven watches our every move, and rewards us accordingly. If you have been channelling your energies into making positive changes for yourself and those around you, your good fortune will soon come upon you. You won’t be able to hide it – everyone will see the special grace that is in your life, as a result of your pure hearts and good deeds. Therefore do not be afraid. Destiny has forged a path ahead for you, and the Goddess invites you to walk this path with Her. Go forward with the blessing of Heaven, and may the Goddess guide your steps.